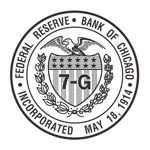 The Federal Reserve Bank of Chicago serves the Seventh Federal Reserve District, which covers the state of Iowa; 68 counties of northern Indiana; 50 counties of northern Illinois; 68 counties of southern Michigan; and 46 counties of southern Wisconsin. A branch bank is located in Detroit, Michigan. This theme highlights historical and current documents by and about the Chicago Fed.